After the success of the first Tourbillon entirely manufactured in its own manufacture and launched in 2008; HYSEK enriched the Abyss Tourbillon collection with a 18k rose gold and titanium version. The Abyss Tourbillon is the first movement imagined and manufactured by HYSEK, this piece of character, with a robust and asserted look is a visual and technical marvel. This piece presents a power reserve and a big date. The disk of the date is visible behind a marvellous sapphire dial which covers half of the Tourbillon. 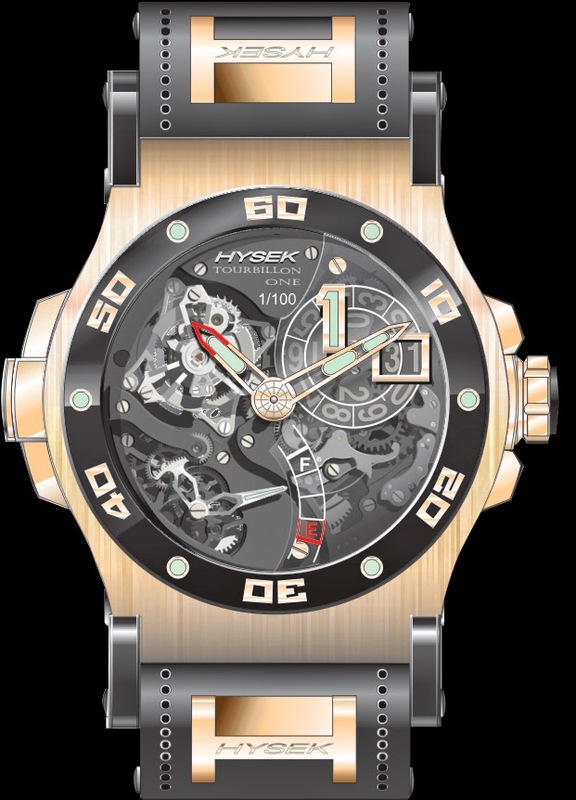 This Tourbillon movement is housed in a sublime rose gold case with black titanium horns and prolonged by an articulated strap in leather and perforated rubber with H insert in gold, which ends in a double secured fold over buckle exclusive to HYSEK; which strengthens the avant gardiste and virile side of the brand. Model limited to 50 pieces.